But, in an effort to help with hosting costs (and to better hone my SEO skills) I decided to put Google Adsense ads on it. The funny thing is, out of the 4 or 5 project sites that I have (and have put considerable effort into), it is my wife’s site that is ranking keyword terms on page 1 of Google. Add to that, she is not poring over her copy, adjusting terms in an effort to show up higher in the SERPS; no, this content just freely flows from her noggin, and ranks naturally. Meanwhile her webnerd husband’s sites continue to wait to see the ranking light of day. 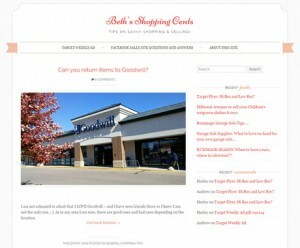 The first term that BethsShoppingCents.com (BSS) ranked for was “Goodwill Return Policy“, where BSS made it to the first page of Google sometime in late 2013, even though the site had only been up since late 2012. After that BSS returned to (and remained ) on page 1 of Google in 2013 for “Target Costume Return Policy“. When I saw this 2nd, page-1 search engine result, it made me decide BethsShoppingCents.com should no longer be treated as “just a blog”, and should be taken seriously. 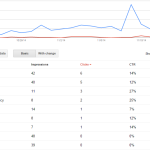 And beyond some best practices for SEO and Google Adsense, I was going to start developing content for the site, as well. Beginning in the end of July 2014, every Sunday (time depending, based on sleepiness/church/honey-do lists), I take the 24 to 36-ish page Target flyer from the Sunday paper that is delivered to our home, and scan it into digital form, rip as a pdf, post to BSS, and then post a link on the BSS Google+ page. Scanning and ripping the pdf usually takes about an hour and a half, posting and promoting it (G+) – about twenty minutes (with effort towards proper keywords in the title, URL string, image alt tags, etc.). I made one initial post to my friends on Facebook about it, but really had no interest in spamming it to the site every Sunday, nor begging my friends to like a Beth’s Shopping Cents Facebook page, so I chose not to make one, nor a twitter account (the latter would require a lot of work to acquire followers that were “real”, and I already was spending about 2 hours of every Sunday on this project). By late September, I had picked up a regular follower (and commenter!) 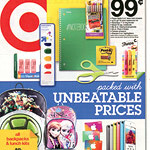 ; someone in Minnesota who was …looking for the target Ad in pdf form, it turns out. “Shelby” (name changed / not looking to scare them away) is a Target employee who uses my weekly pdf while at work because it is the easiest way to browse it in digital form. I HAVE BEGUN TO PROVIDE VALUE TO SITE VISITORS. There’s still a bunch to do. As a 40-something guy web guy who does not have too many hobbies, I had never really embraced Pinterest. But having done some research, its clear that I / this site needs to. I have begun to create a Pinterest page for BSS, and will get it finished and then verified (learn why this is important). …and most important – continuing to provide value to site visitors. 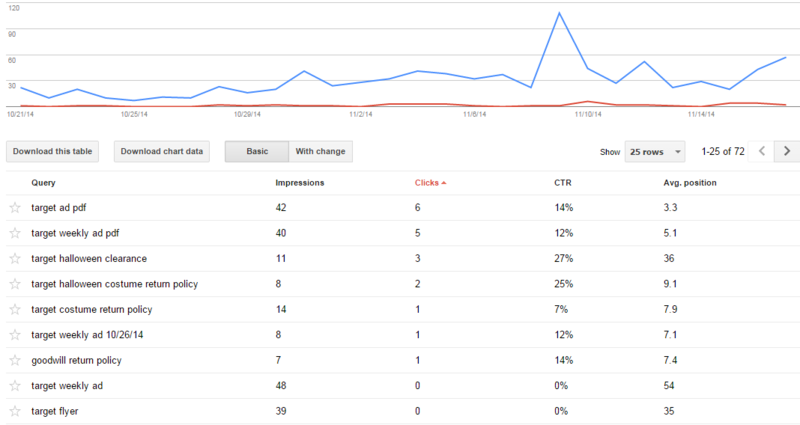 Then and only then will the site begin to accrue more visits and hopefully, some real Google Adsense income.